Bodalla and the Morts explains why the small village of Bodalla has two beautiful churches designed by celebrated nineteenth century architects, and a hotel once considered by the well-to-do the only place worth staying south of Kiama. It details Bodalla’s pioneering role in the Australian cheese industry, initially due to the determination of Thomas Sutcliffe Mort. Mort was a leading figure in trade and commerce in mid nineteenth century NSW. He believed passionately the growing Colony should develop its own agriculture and manufacturing industries. His enterprises included the auction of wool and pastoral properties, building ships and locomotives, gold mining and shipping, and a pioneering role in the frozen meat export trade. 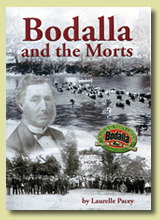 Mort established the Bodalla Estate in 1860 as his country residence, but went on to show how cheesemaking in Australia could move from being a cottage to a factory industry. The book’s main focus is on the Mort family’s long association with Bodalla, the Estate’s various stages under different managers, through to the sale of the Bodalla Company and the Estate to Panfida in its bid to control the Sydney milk market, and the subsequent break-up of the Estate. Bodalla and the Morts draws extensively on primary sources – Bodalla Company records, contemporary newspaper articles, and Mort family letters and journals – and is enriched with many early photographs from the Mort family archives. 144 pages, over 160 images. Cost $40, plus $9 p&p. Narooma was once quite a busy port with up to three ships in port at the one time. 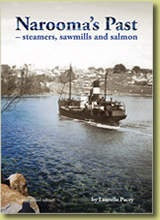 Ships took timber from its sawmills to Sydney and returned with supplies for the town. Yet little remains today to remind us of the many ships and seamen who braved the bar at the Inlet’s entrance, of the ships built in the Inlet, or of the frustrations when ships were bar-bound, and attempts to improve Narooma as a port. Many goldminers passed through the area, some staying a short while, while bullockies, millhands and sawmillers worked the forests around Wagonga Inlet for almost 100 years. Narooma had Australia’s first fish cannery, following the visit of American author and game fisherman Zane Grey, where salmon and tuna were canned for many years. It also had private hotels and guesthouses with a style and glamour most other south coast towns lacked. Narooma has been a tourist destination for almost 100 years, but in the 1920s and 30s it was the holiday destination for the adventurous or well-to-do people from grazing properties out west and professional people from Sydney. They enjoyed regattas at Ringlands Point, picnics up the river or out to Montague Island, and big game fishing off the coast. The Lure of Montague includes stories about the construction of the lighthouse and the keepers’ residences, about living on Montague and the difficulties families had in receiving supplies, the secret Navy station, and the impact of a remarkable woman Judith Cassell in her determination to conserve the island’s seabirds, Little Penguins and seals. 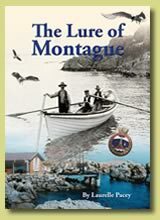 It also tells of many characters associated with Montague over the years, including Ian Cameron whose association with Montague went back over 80 years to when his father was a lightkeeper culminating in Ian being in charge of lighthouse maintenance in NSW. There are also stories about the island’s cunning horse that preferred swimming to the mainland to working, and the formation of the first gamefishing club in Australia at a camp on Montague. More recent history includes the community’s fight in the 1980s to keep lightkeepers on Montague, to keep the Light mechanism in Narooma, and the Commonwealth handing the island’s management over to the National Parks and Wildlife Service of NSW, and its subsequent challenges. 72 pages, 64 images (including maps). Cost $25, plus $3 p&p. 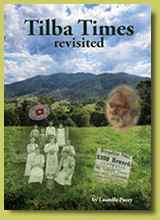 Tilba Times tells of the local Aboriginal people and their close ties with the Bate family, the development of cheese factories in the district, and of mining on the mountain when Gulaga was once home to about 300 people. Tilba Tilba was once the major village in the district, predating Narooma and Central Tilba. It had a reticulated water supply and generated its own electricity long before other places on the south coast. Central Tilba grew up around the ABC Cheese factory, the first cheese co-operative in NSW. When the Co-op merged with the Bega Co-op in 1972, Central Tilba had to reinvent itself to survive. This led to its National Trust heritage listing and a new phase for the area led by a pride in its past. It includes a small history of each of the main properties in the area. 64 pages, 63 images (including maps). Cost $22, plus $3 p&p. 144 pages, over 160 images. Cost $40, plus $10 p&p. 90 pages, 103 images (including maps). Cost $30, plus $3 p&p.